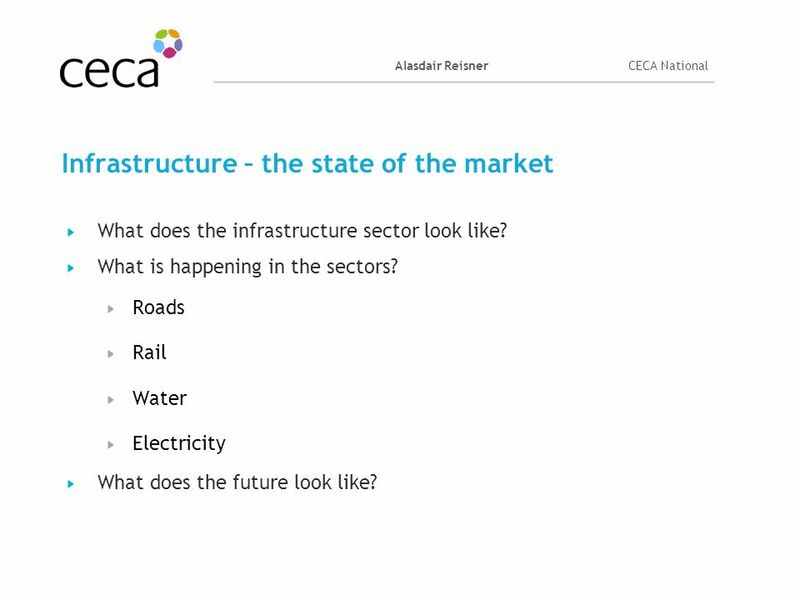 3 Alasdair ReisnerCECA National Infrastructure – the state of the market What does the infrastructure sector look like? 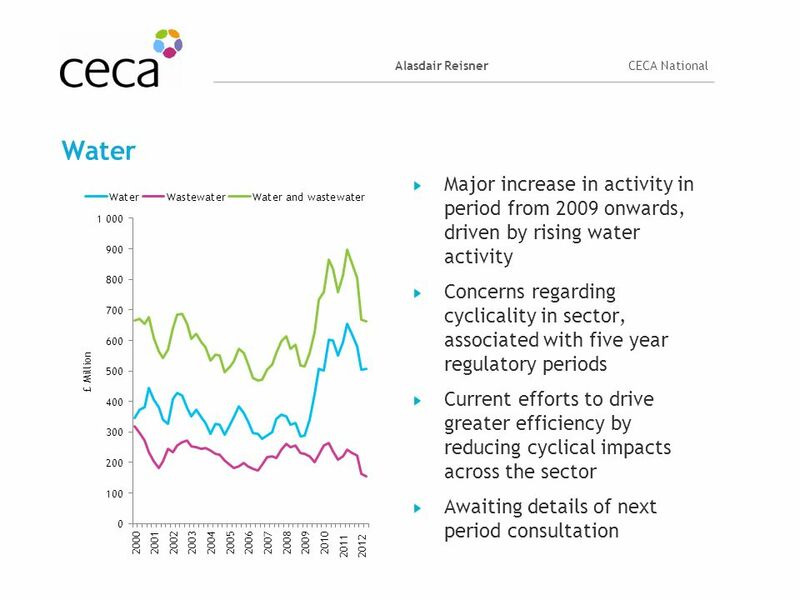 What is happening in the sectors? 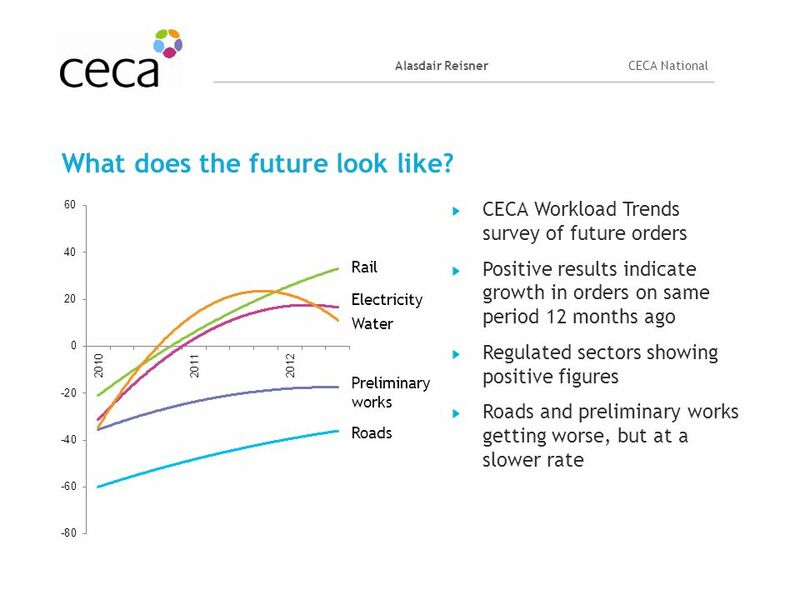 Roads Rail Water Electricity What does the future look like? 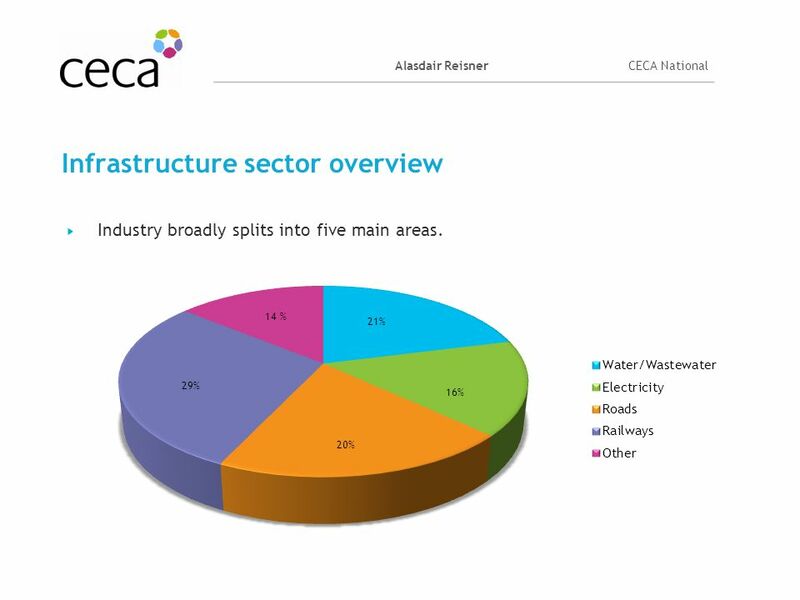 4 Alasdair ReisnerCECA National Infrastructure sector overview Industry broadly splits into five main areas. 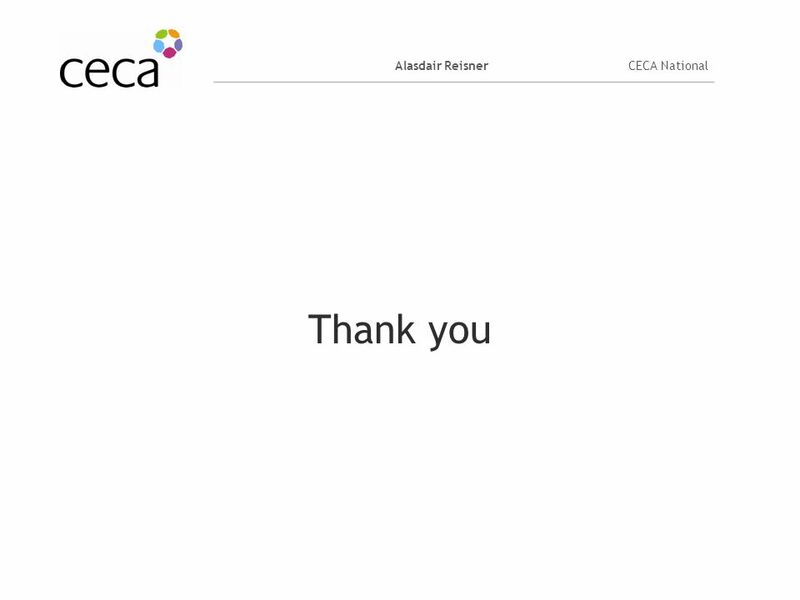 11 Alasdair ReisnerCECA National Best case scenario? 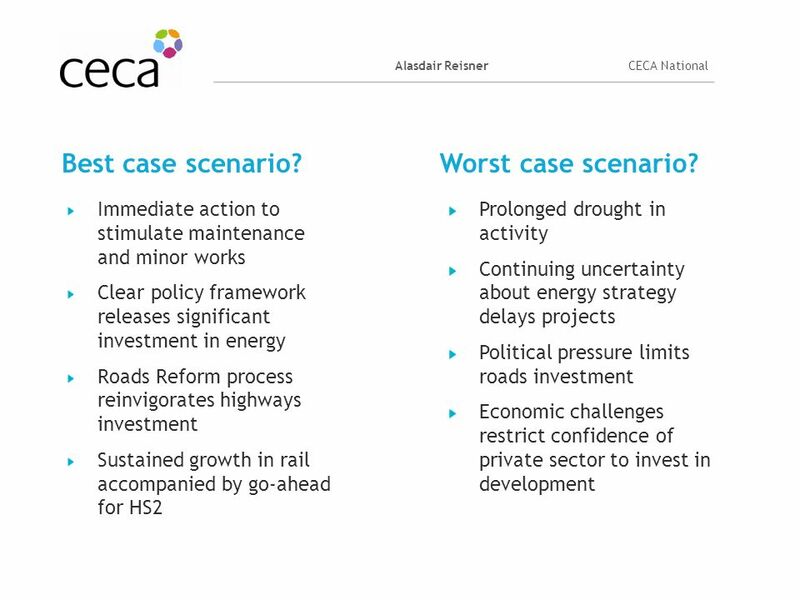 Immediate action to stimulate maintenance and minor works Clear policy framework releases significant investment in energy Roads Reform process reinvigorates highways investment Sustained growth in rail accompanied by go-ahead for HS2 Prolonged drought in activity Continuing uncertainty about energy strategy delays projects Political pressure limits roads investment Economic challenges restrict confidence of private sector to invest in development Worst case scenario? 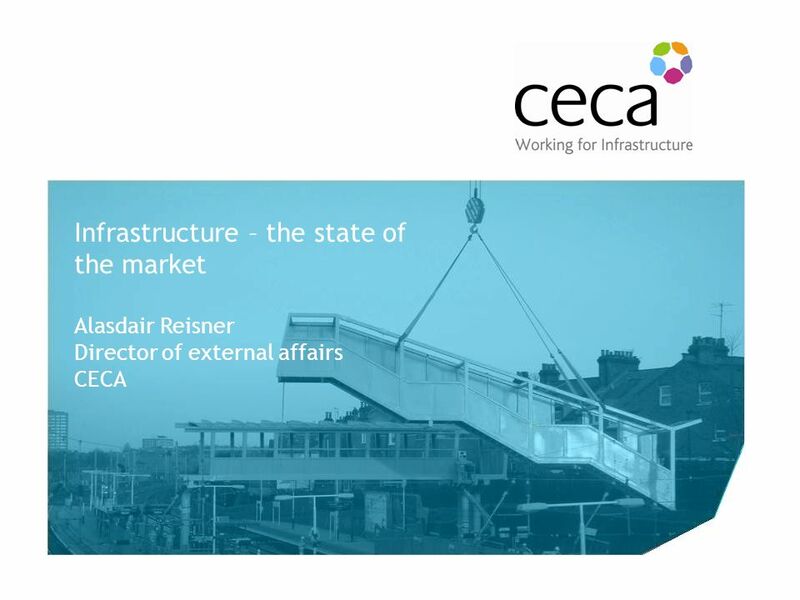 Download ppt "The Future of the CECA Rail Forum Infrastructure – the state of the market Alasdair Reisner Director of external affairs CECA." 1 SDC Climate Change Event Dr Keith MacLean Head of Policy and Public Affairs. 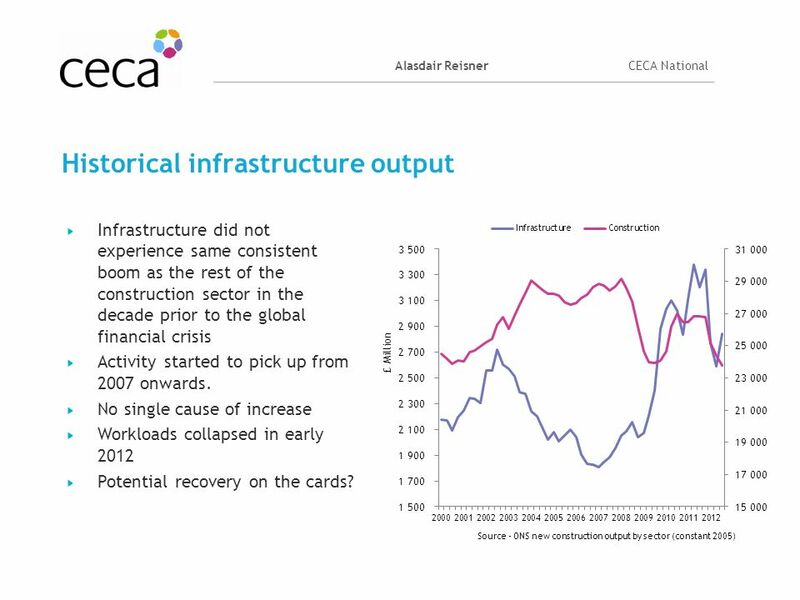 ‘SMART’ REGIONS LEADING RECOVERY? 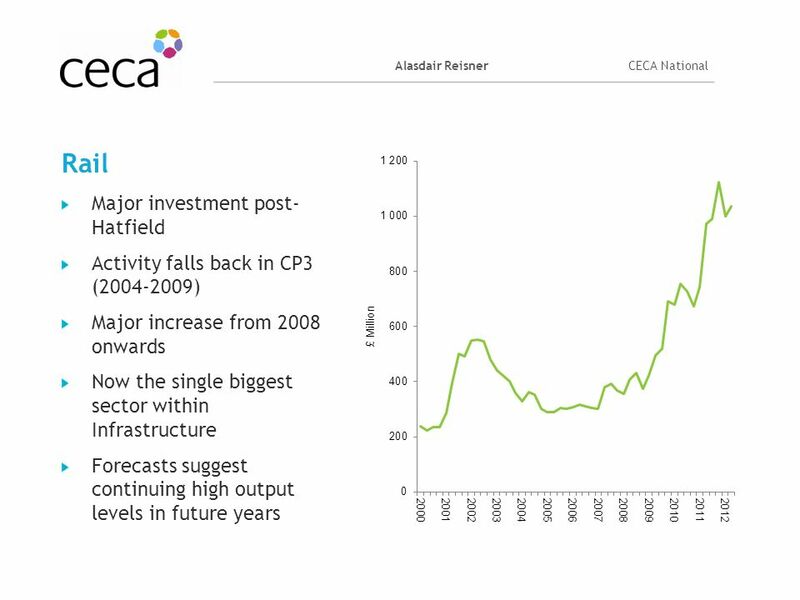 POST-CRISIS EU-AUSTRALIA COMPARATIVE POLICY ANALYSIS Professor Bruce Wilson, European Union Centre at RMIT European Union. 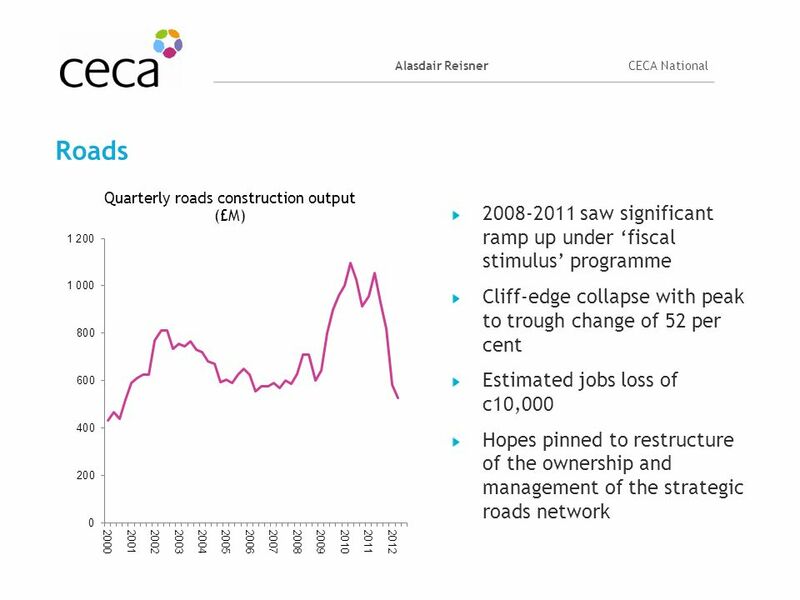 The View of the Road Ahead FPC AGM Alasdair Reisner Chief Executive CECA. 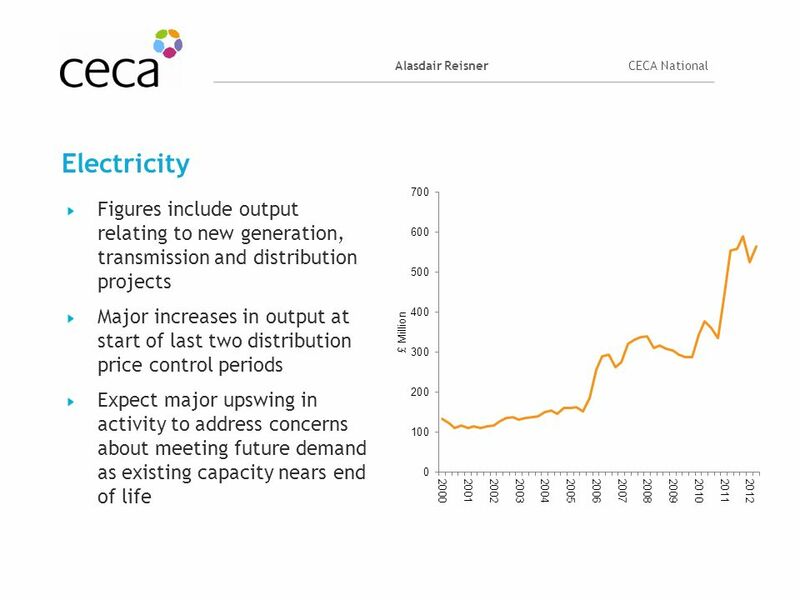 A 2030 framework for climate and energy policies Energy. 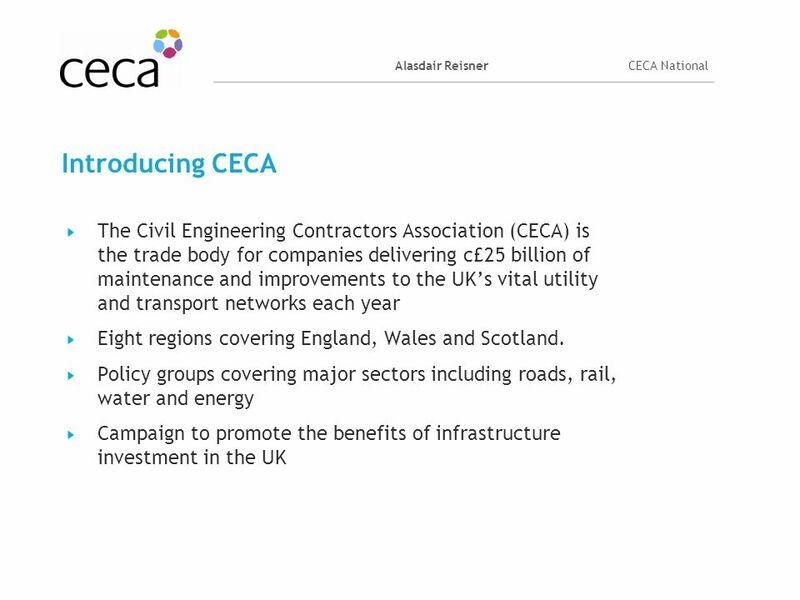 A National Recovery Plan for Wales. Key Challenges The South Wales Chamber of Commerce identify the following key areas as they impact on the Business.